Salon professionals such as Rayna Hair Artistry are listening to clients needs for more personal attention by investing in a 'salon suite'. 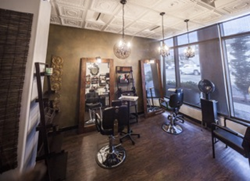 Discerning hair mavens are discovering the benefits of a private salon suite vs. large-scale salons. Professionals to Fashionistas and those who fall in between have found what they never knew they were missing. ‘Salon Suites’ or ‘Boutique Salon Suites’ are the prolific new kids on the block with Phenix Salon Suites leading the industry ranking in Entrepreneur Magazine Top 500 Franchise not once but twice, consecutively. Phenix Salon Suites creation of luxurious yet spacious salon-suites is an attractive ideal made into a reality.